Hospitals and clinics are no strangers to the reality of workplace MSDs (musculoskeletal injuries) impacting doctors, nurses, and CNAs. As a matter of fact, Electro Kinetic Technologies has already extensively covered the kinds of solutions designed to protect hospital staff members in the area of safe patient transport, one of the most glaring areas of injury risk. However, we also want to touch on the solutions available to hospital support staff and janitorial employees exposed to MSD risk, who experience problems similar to those seen in the hospitality industry. Though safe patient transport is still one of the most important areas hospitals can improve upon, it’s equally important not to forget about the other ways hospital employees can be vulnerable to injury. A prime example, and the focus of this blog, is moving manual linen and laundry carts, an essential hospital service that helps to prevent the spread of bacteria to patients and staff. As a general rule of thumb, any force that exceeds 40 lbs. can cause either acute or chronic MSDs in the form of sprains, strains, or even carpal tunnel. Laundry carts packed full of the linens needed to care for hundreds of patients can reach a surprisingly heavy weight, and over time, pushing that load around corridors, up and down inclines, and through heavy hospital traffic will cause injury. It’s not a matter of “if”, it’s “when”. Just like any other business that has janitorial or maintenance staff operating manual supply carts, hospitals know their support staff requires some kind of ergonomic solution. Motorized carts and tuggers allow hospitals flexibility in how to address the MSD risk posed by manual linen and laundry carts. 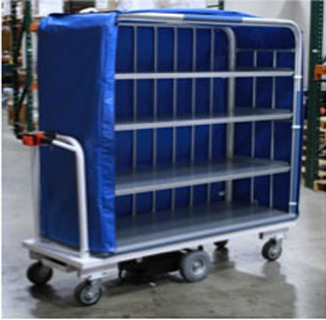 Motorized linen carts make navigating turns and inclines safer by eliminating the push/pull forces required to operate a manual linen cart. This type of solution might be ideal for a hospital or clinic that requires maximum maneuverability, which is provided by the ability to pivot around the cart’s center wheel drive system. This approach also means there’s no need to share a tug among a number of carts. In contrast, tuggers can save money by being shared among a large number of carts so there is no need to motorize the carts. They also are well-suited for safely transporting a string of manual linen carts simultaneously, and special hitching methods can allow tuggers to move carts that can’t be modified with a hitch, whether due to the large number of carts or to ownership of the carts by a commercial laundry. Which Type of Linen and Laundry Solution Will Work Best For You? In order to find the right ergonomic motorized solution that will protect your hospital support staff, we recommend making a list of requirements and vital information, i.e. payload, number of carts, size of hospital, and overall budget. Working directly with either a safety engineer or a motorized equipment specialist can also help to ensure that the final purchase will cover all of the bases. Our team of ergonomic equipment engineers specializes in assessing the needs of our customers and providing solutions tailored to their applications, and we’re always here to assist you in keeping your employees safe and workplace productivity high. For more information on the types of motorized equipment available for hospital staff, connect with us via the Contact page.